Can anyone imagine the sadness that crept up on me, when we entered Momofuku Bakery after a freezing cold and hefty odyssey through NYC’s East Village only to find out that I was out of luck! My happy order was instead answered with shrugged shoulders and an unacceptable Sorry, we don’t have Chorizo Challah today. I was devastated, the Chorizo Challah was the actual reason why we had come here in the first place! The lovely girl behind the counter tried to make up for it by praising their other products and of course I couldn’t help and try some. A cup of strawberry milk and some fairly oversized and still warm cinnamon buns later the world didn’t look as bad anymore as before. And still… I couldn’t stop thinking about that ominous Chorizo Challah. Peel the skin off the chorizo and cut into small cubes. Melt the butter in a small saucepan, then add the sausage cubes and saute for about five minutes over medium heat. Set aside and let cool off. Crumble the fresh yeast into a bowl, add sugar and lukewarm water, then stir until everything has dissolved. Mix the flour together with the salt in either a big bowl or the bowl of your food processor/KitchenAid. 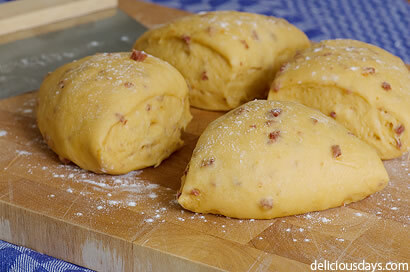 Now add, one after another, the yeast water, the eggs and the liquid (yet cooled off) butter together with the chorizo cubes and knead on low level or by hand until you receive a smooth and elastic dough. After two or three minutes of kneading the dough should come together beautifully and the sides of the bowl should be clean, otherwise add flour by the tablespoon. Shape the dough into a ball and let rise in a lightly oiled bowl tightly covered with cling-film (in a warm and draft-free spot) until the dough has doubled its volume (about 1 hour). Preheat the oven to 200°C (390 °Fahrenheit). Depending on your desired bread (do you want to bake a three, four or even six strand bread? ), divide the dough into equally sized portions and roll into even ropes on your work surface. Gather and press the ends together, then braid the strands (if you need help you may want to check out these braiding instruction videos here or here). Lightly tuck both ends underneath the bread to ensure a nice and even look. Place on a parchment paper lined baking sheet and let rise – covered with a kitchen towel – for 30 more minutes. Beat the egg yolk and milk together and generously brush the loaf with it. Bake on middle level (or one below) for 25 to 30 minutes until golden brown. Cover with aluminium foil, if the breads gets too dark too quickly. Thats an interesting recipe, all the braided breads I have had before have always been quite sweet. I will definetly have to give it a try! I'm still the sweet challah type of baker. But why not trying something new? Your challah looks delicious - I'll give it a try. After easter holiday. I am so going to bake this bread! Lovely idea, beautifully done! Thank you for sharing. This reminds me of buns in my childhood. The bakery is already closed for ages. They made it with bacon and I loved it so much. I will try your recipe with bacon. Perhaps I will feel like a spring chicken. Thanks a lot. I WILL make it soon, it looks so good and moist, I can almost smell the chorizo, lucky me, I´m in Spain, and even got some chorizo in the refrigerator right now!! I love Chorizo, just love it. I like that you made a fusion treat out of this... Have a fab weekend. Wow! That looks fantastic. I love the way you infused the butter with Chorizo. It's such a shame they didn't have the challah when you went to NY. Looks like you've done a marvellous recreation though. Mmm, mmm, and mmm! I can see why you struggled to get the image out of your mind! I adore chorizo, but recently I have come to love the Philippine equaivalent (where I'm holidaying currently) longganisa. With its sweet taste, I think it would go beautiful in that yeast bread also... a belated Easter treat for me perhaps? I think so :) Thanks for the recipe! This is pretty much the same bread my Portuese in-laws brought yesterday. Even my kids (3&5) love it. Thanks for the inspiration and the recipe! I made this for an Easter brunch yesterday and it turned out beautiful but kind of dry. This was my first time making Challah and I haven't had it alot before so I'm wondering: what is the consistency supposed to be like? I can't wait to try the recipe again to see if I can make it better! Wonderful idea! The photos are great! My husband would love that bread! OMG - I have been experimenting with dough lately and this one looks delicious... and I believe would offset the slight sweet bread beautifully. Thank you for sharing! 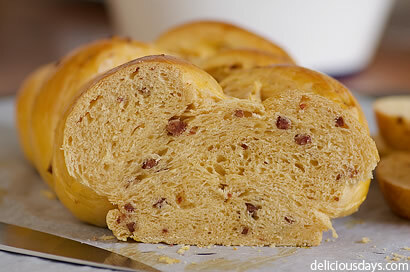 Challah with chorizo. Delicious combination. 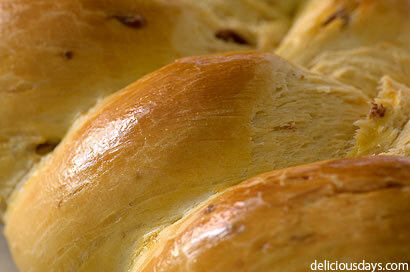 I have never eaten savoury challah before - only sweet or plain. Challah is actually on my list of breads to bake so I will take inspiration from you and myself will try something a little different from the traditional versions. Thank you! This sounds like a GREAT idea. Love challah, love sausage...It probably wouldn't work as well with soft Mexican chorizo, would it? May have to try it anyway. mhhhhh das sieht ja super lecker aus! I recently made a semi-traditional Osterzopf, since it doesn't have any butter,milk, or sugar in it, but extra virgin olive oil and chestnut honey. 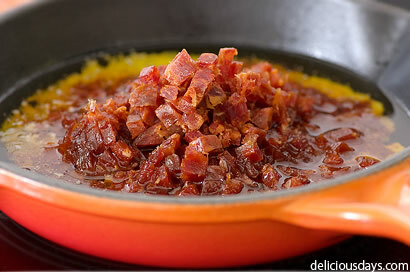 But now I'm fantasizing about all sorts of Osterzopf variations, especially with savory little specks of Chorizo! I used your recipe for a challah with bacon and it turned out great, very fluffy and moist. As soon as I can find some chorizo I will try it again. Thanks for being such a great inspiration. I'm hungry when i see these pics. thanks for the recipes. sound like to delicious to try this menu....! i can wait to try ...! I LOVE Bread!!!! I just started on The 100 Calorie Diet. You do get to eat bread on this one. This bread looks awesome!!! How hard is it to make? Any idea of the calorie counts??? Mmmmm I can smell it baking already!!! This is very similar to pao con chourico which is a Portuguese dish. I've never made any kind of bread before but my husband is Portuguese so I thought I'd give it a whirl and he loved it. I must say I've come across some recipes for braided bread but I've never been compelled to try them out. Yours however, wow. The pics are the clincher. Thanks! Looks like heaven that you can eat! Danke und Grüße aus dem Rheinland!